We are on the tail end of this month’s “giving back” program – FIGHT HUNGER Campaign. We did chemo comfort bags and zipper pouches for our soldiers. We raised money for Smiles for Trevor and Relay for Life and we have helped families. When I began my journey with Thirty One, I wanted to make a difference in the lives women and families and you are helping me do it! Because of YOU, my AMAZING customers, hostesses, family and friends – we are making a difference. Okay, so I am sure you can guess where this is leading…. YOU GOT IT – we need more sponsors. Word got out and I have had more requests than I currently have sponsors for so I am putting out a plea for YOUR help. BREAKING NEWS: We are teaming up with Haven/Beat the Streets in Ocean County to bring a smile to the kids who are living in motels/ shelters. I am so excited about this joint effort. 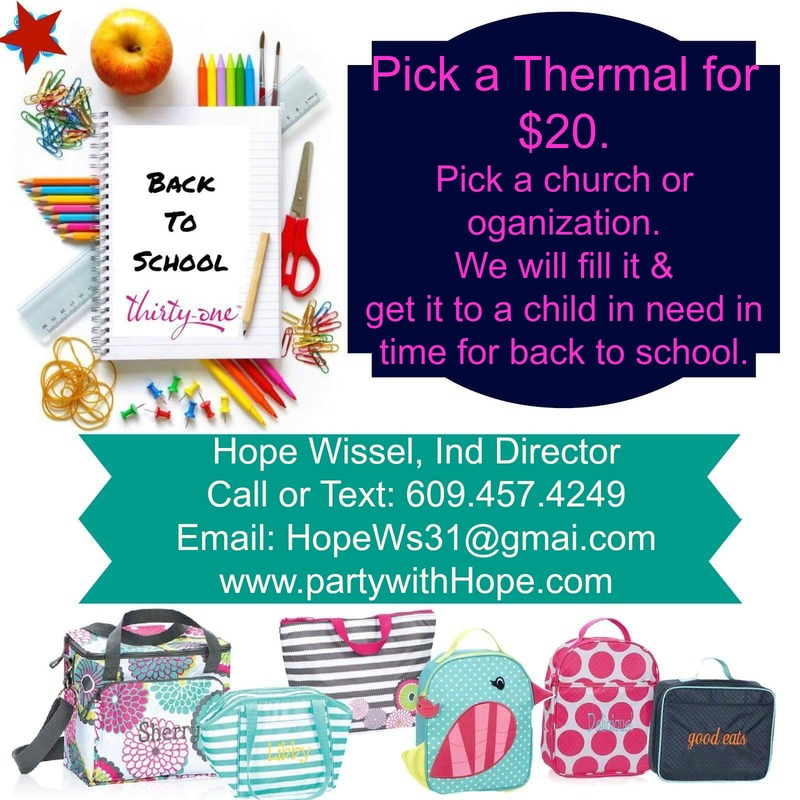 I am providing THERMAL LUNCH TOTES to children who are currently homeless – living in motels. I will be using my commission to fill the thermals with some healthy snacks along with tips on inexpensive ideas for healthy lunches. I mean let’s be honest, the FREE lunch program doesn’t always have foods that kids eat. No hate mail PLEASE because I know that there are some places that have great meals but let’s be honest, not all of them do. So, for $20, you can sponsor a thermal tote filled with healthy snacks for a child in need. If finances are tight and you can’t donate, maybe you know a business that may want to help, GREAT! Let me know or forward this information to them. I will supply a list of business sponsors in every thermal tote along with blogging about them – FREE advertising for helping out a great cause. Where else could they get FREE advertising for $20? Today I want to CELEBRATE you! Many of you have been a part of my “giving back” program this year. 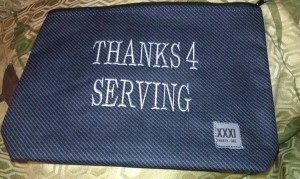 We have done chemo comfort bags and zipper pouches for our soldiers. We have raised money for Smiles for Trevor and Relay for Life and we have helped families. When I began my journey with Thirty One, I wanted to make a difference in the lives women and families and you are helping me do it! To date, the programs have been a success with the help of my AMAZING customers, hostesses, family and friends. Individuals who believe in the cause, or just want to help. Okay, can you guess where this is leading…. YOU GOT IT – a new month, a new project. You have heard of the “Back to School” campaigns that provide kids with backpacks and school supplies, right? These programs help each child start off the school year on the right foot. This year, I will be providing THERMAL LUNCH TOTES to children. I will be using my commission to fill the thermals with some healthy snacks along with tips on inexpensive ideas for a healthy lunch or snack. I mean let’s be honest, the FREE lunch program doesn’t always have kid friendly foods. No hate mail PLEASE because I know that there are some places that have great meals but let’s be honest, not all of them do. So, for $20, you can sponsor a thermal tote filled with healthy snacks for a child in need. If you want to help BUT you don’t have $20, donate what you can – $1, $2, $5, or $10. Finances are tight BUT you know a business that may want to help, GREAT! Let me know or forward this information to them. I will supply a list of business sponsors in every thermal tote along with blogging about them – FREE advertising for helping out a great cause. Where else could they get FREE advertising for $20 or $40? 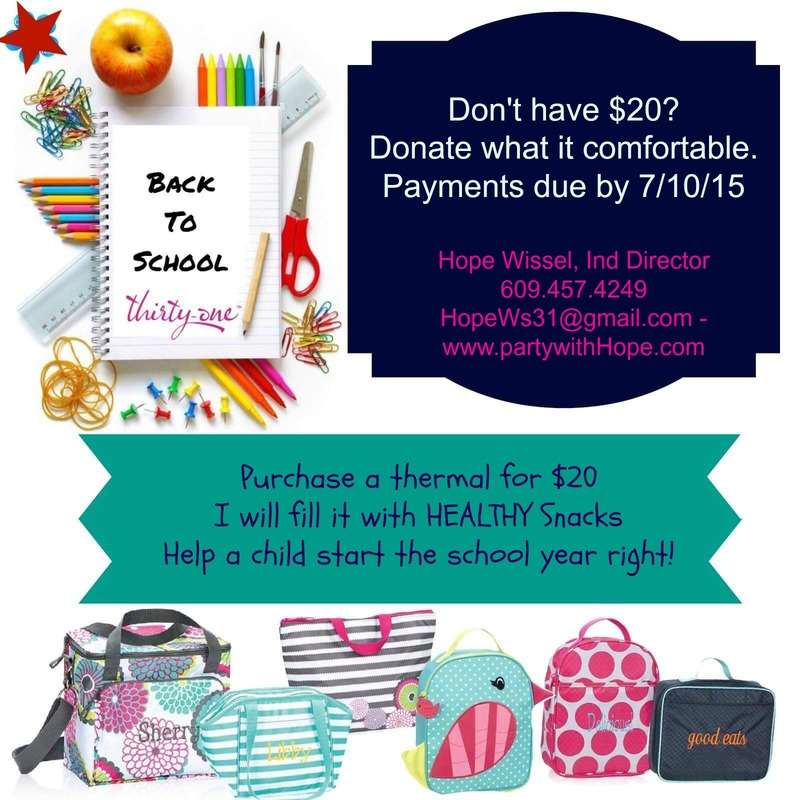 As you all know, one of my biggest WHYs with Thirty One is giving back to the community. With the help of my family, friends, customers and hostesses, I have blessed to be able to make donations to various causes that have been near and dear to my heart. As a team, we have donated to the Pediatrics Unit at Ocean Medical Center, Enchanted Makeovers (a program for women in homeless shelters), back to school bags to Hawthorne House, and our latest random act of kindness was Chemo Comfort Bags for those in treatment at Ocean Medical Center. For just $23 you can sponsor a Zipper Pouch personalized. I will use ALL of my commission to fill them with mints, candy, trail mix, gum, crossword puzzle book, a thank you card and a small American flag. My goal is 31 zipper pouches sponsored by April 28th. Yes, that is only 14 days away but I have faith in all of you. The bags will be shipped out so that they arrive before the end of May to show our military men and women how much we appreciate them. So, who is with me? For $23 you can bring a smile to the face of some one who is far from home defending our freedoms. This project is near and dear to my heart. My nephew is a recent boot camp graduate and I am reminded of the days and nights spent with my best friend and her 4 kids while her hubby did TWO tours in Bagram during Operation Freedom which is what prompted me to get busy. Payments can be made via check or through Paypal at hopesgiftcloset@@comcast.net. If you don’t have Paypal, I will be happy to invoice you.